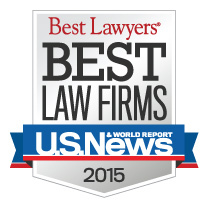 Bowles Rice LLP has been ranked nationally and regionally among the 2015 "Best Law Firms" by U.S. News & World Report and Best Lawyers®. Bowles Rice was recognized nationally in the area of Mining Law and regionally, in 44 different areas of law across West Virginia and in Lexington, Kentucky. A full list of the firm's recognized practice areas is included below. The "Best Law Firms" rankings, for the fifth consecutive year, are based on a rigorous evaluation process that includes client and lawyer evaluations, peer reviews from leading attorneys in their field and review of additional information provided by law firms as part of the formal submission process. Firms included in the 2015 "Best Law Firms" list are recognized for professional excellence with consistently impressive evaluations from clients and peers. Earlier this year, 54 Bowles Rice lawyers were recognized by Best Lawyers in America, underscoring the depth and scope of the regional law firm's capabilities. Bowles Rice is a full-service law firm with 150 attorneys serving clients from eight offices located in Charleston, Martinsburg, Morgantown, Moundsville and Parkersburg, West Virginia; Southpointe, Pennsylvania; Lexington, Kentucky; and Winchester, Virginia. The magazine's publishers divide West Virginia into two geographic or "metropolitan" areas. The Charleston Metropolitan Area encompasses the southern part of the state and includes Parkersburg, West Virginia. The Morgantown Metropolitan Area includes Martinsburg, West Virginia and the northern part of the state.